eMail Bounce Handler operation is very simple. It has been prepared to accept and process data from all kind of sources so it starts checking if that data corresponds to a bounce or not. In the case it is a bounce, it extracts the recipient email address of the original message. To perform such filtering it uses several sets of rules, some are public and customizable but others are internal and fixed. If eMail Bounce Handler determines the data it has receives corresponds to a bounce and some customizable rules are met the data is processed and recipient address is extracted and added to the bounce list. Each list entry is made of a check box, a status icon, the bounce type (Soft or Hard), the extracted email address, the error description, the bounce date and how many times messages sent to that address have bounced. If the address is new, a new entry is created. If the address already exists, the count column on the right is updated. If the bounce count reaches the limit set in the settings panel (below) the address is checked for exportation and icon is changed from a Warning to a Stop icon. Note that Hard bounces are fatal errors thus the check box is automatically checked on entry creation. Soft bounces are generally produced by a temporary condition however if the messages sent to an address cause too many soft bounces we consider it as a fatal error so as soon the threshold is reached the entry is automatically checked. When exporting your bounce list, only checked addresses will be saved. That allows you to use the same list with several campaigns and delete only the addresses producing hard bounces or bouncing too frequently. 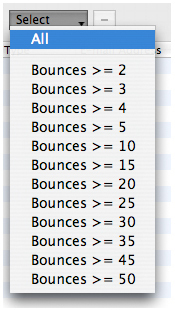 You can force eMail Bounce Handler to select all entries or select them depending on the bounce count. Open your mail application. Select a bounce. Set the application to display all headers and copy all the text. Switch to eMail Bounce Handler and select the 'Edit | Paste Special' menu or 'From Clipboard' from the 'Dredge' button. The text is automatically processed and the bounced email addresses are added to the list. You can repeat the operation as many times as needed. Open your mail application. Select one or more bounces and save them to a file making sure all headers are also included. Switch to eMail Bounce Handler and select the 'File | Dredge | From a Text File' menu or 'From a Text File' from the 'Dredge' button. The file is automatically processed and the bounced email addresses are added to the list. In the case you have more than one file to process at a time you can also drag and drop them all to eMail Bounce Handler list. You can repeat the operation as many times as needed. You can directly dredge folders in Apple Mail, Microsoft Entourage and PowerMail. It is recommended to use a specific folder and a set of rules to gather all bounces. That way, you can process that folder selecting the corresponding 'File | Dredge' menu or pressing the 'Dredge' button. You just have to type the name of that folder to get eMail Bounce Handler process all your bounces. 2.- Launch MaxBulk and send your message. 3.- Wait until delivery is done. 4.- Launch eMail Bounce Handler. 5.- Set it to run every 15 minutes. 6.- Wait at least 60 to 120 minutes until eMail Bounce handler is finished. 7.- Save eMail Bounce Handler bounce addresses list. 9.- Rename the file to "DELETE" or "UNSUBSCRIBE" and drop it over your master list in MaxBulk. Usually you will use the same eMail Bounce Handler document again and again after each mail campaign. Once you reach a given number, say 10 mailings, you can choose to generate the DELETE / UNSUBSCRIBE list with all addresses that have bounced 10 times.